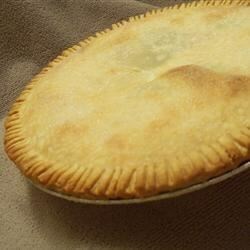 "This is really a good pie and it is so easy to make. It won a prize." Preheat oven to 425 degrees F (220 degrees C). Roll out pastry shell and allow to rest in refrigerator. Line a 9 inch pie pan with one rolled out pastry crust. In a medium mixing bowl combine pie filling, cinnamon, nutmeg, and lemon rind. Stir until fully combined and spread into pastry lined pan. In a small mixer bowl combine egg, sugar, lemon juice, cream cheese, and sour cream. Beat at medium speed until smooth. Spread cheese mixture over apple mixture, and place top crust over filling. Seal edges, cut some steam vents in top crust, and sprinkle top with sugar. Bake in preheated oven for 25 to 30 minutes, until golden brown. Cool completely before serving. See how to make a double-crust cream pie topped with cinnamon-glazed apples. This was ok. The flavor wasnt out of this world like I thought it would be with the rave reviews this recipe has gotten. Probably won't make this again! Instead of using store bought apple filling I made my own. Even so this recipe was easy and added a nice touch to everyday applepie. I accidentally mixed the lemon juice in with the apple filling instead of the cream cheese mixture, but it was still very good!! !